University of Notre Dame entomologists are part of a team of researchers that recently discovered a potentially dangerous new malaria-transmitting mosquito. The as-yet-unnamed, and previously unreported, mosquito breeds in the western areas of Kenya and has an unknown DNA match to any of the existing malaria-transmitting species. The Anopheles species of mosquitoes, which transmits malaria in Africa, is already widely studied by researchers. It prefers to rest indoors during the day and feed on humans during the night. Current malaria control programs, including spraying of insecticides and using insecticide-treated bed nets, are designed with these behaviors in mind. Although the new species has never been implicated in the transmission of malaria, new discoveries in its biting habits pose a threat because it was found to be active outdoors and prefers to bite people earlier in the evening, soon after sunset, when people are not protected by current malaria control techniques. Neil Lobo, a Notre Dame research associate professor, and Brandy St. Laurent, a former Notre Dame doctoral student, joined forces on the team of researchers that made the discovery. 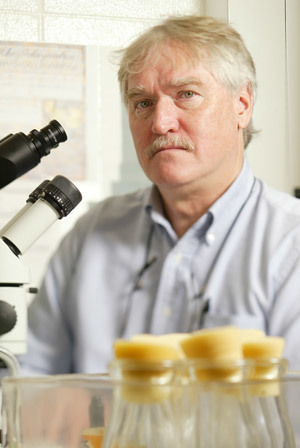 Frank Collins, Notre Dame’s George and Winifred Clark Professor of Biological Sciences, was principal investigator of the Malaria Transmission Consortium effort funded by the Bill and Melinda Gates Foundation. The discovery was announced in a paper whose lead author was Jennifer Stevenson of the London School of Hygiene and Tropical Medicine. “All of the sequencing and analysis was done on campus at Notre Dame,” Lobo said. Malaria is the leading cause of death in Kenya, where 25 million people out of its population of 34 million are at risk. Lobo and Collins are members of Notre Dame’s Eck Institute for Global Health and the Department of Biological Sciences. The Eck Institute for Global Health believes that health is a fundamental human right. It endeavors to promote research, training and service to advance health standards for all people, and especially for people in low- and middle-income countries, who are disproportionately impacted by preventable diseases.